It is really comfortable now – soft and warm. It still looks nice, just not quite as nice. Turns out Jasper adores carrots as much as bananas, so on his walks, we carry a baggie of cut-up baby carrots as training incentives. It is amazing what the right incentive can do. I decided yesterday to start working on getting him to come on command. By the end of the day, he would reliably charge right over to me when I ordered, “Jasper, come!” even if he had his nose buried in some lovely rabbit poop. I was very proud of myself until a friend of mine popped my bubble, asking me if he’d come if anyone else called. I sincerely doubt it. But listening to me is a start, right? I was telling her these stories of my marvelous dog at ‘girl’s night out.’ Every month or so, I get together with several friends of mine for a pot-luck dinner – no husbands or kids allowed. It’s like a book-club, without the facade of a book. The best part is that we never do any food planning ahead of time, just trusting in the fates, and always managed to have a delicious, well-balanced meal. Last night, we had hors d’oeuvres of crackers, cheese, pate, cheese sticks and little cranberry pastries. Dinner was risotto, broccoli and tofu in a delicious sauce, mashed potatoes with carrots, and bean salad. Desert was a baked pear pastry and s’mores pie. Two deserts – it doesn’t get better than that. Besides the eating, we talk. And talk and talk. While kid talk does slip in there (three of us have three kids each), we try to keep it to a minimum. That isn’t just for the sake of the non-kid people present, but because the kids take up so much of our lives anyway, we like to get away and talk about other stuff. It is nice to count on at least one evening a month of chocolate and laughing until I fear I’m going to pee my pants. Love those socks! I want some but my knitting skills aren’t up to par! I do a book club (we actually do read a book every month) and I love it for the same reasons. Food…wine…girl talk… it’s the best! Socks are easy! Really easy! They just look hard. I was shocked at the easiness. 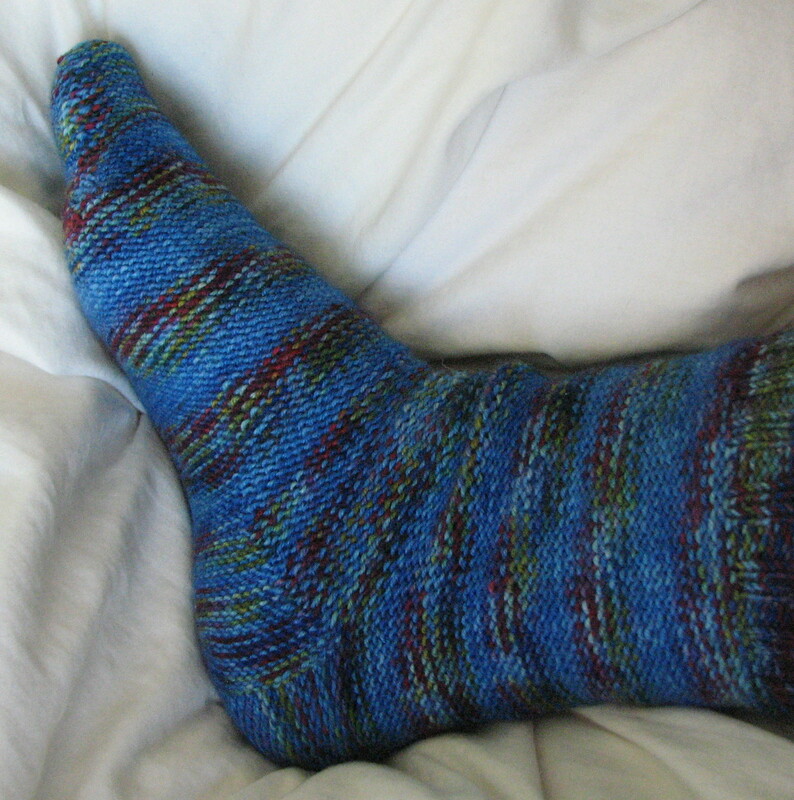 If you can actually make a stitch, you can knit socks. I’ll send you the pattern, if you want. I just came across your post with my tag surfer… I knit a lot of socks. What gauge did you use – that is, how many stitches per inch? If you’re feeling the purl bumps on the bottom of your feet, my guess is that you’re working at a loose gauge for that yarn. For socks you generally want to drop down at least two or three needle sizes from what’s listed on the yarn label, to get a tight gauge – it not only feels better, it wears better too. If gauge isn’t your problem, then you just have sensitive feet (and there’s nothing wrong with that!). It wouldn’t be that hard for you to (in future socks) just knit the sole inside-out by knitting the cuff and instep stitches and purling the sole stitches. Then you’d get the stockinette look for the top and cuff, and not have purl bumps inside on the sole to irritate your feet. OK, I’ve blathered enough in your comments, seeing as how you don’t even know me. Enjoy your socks! 7 stitches per inch. Is that good? 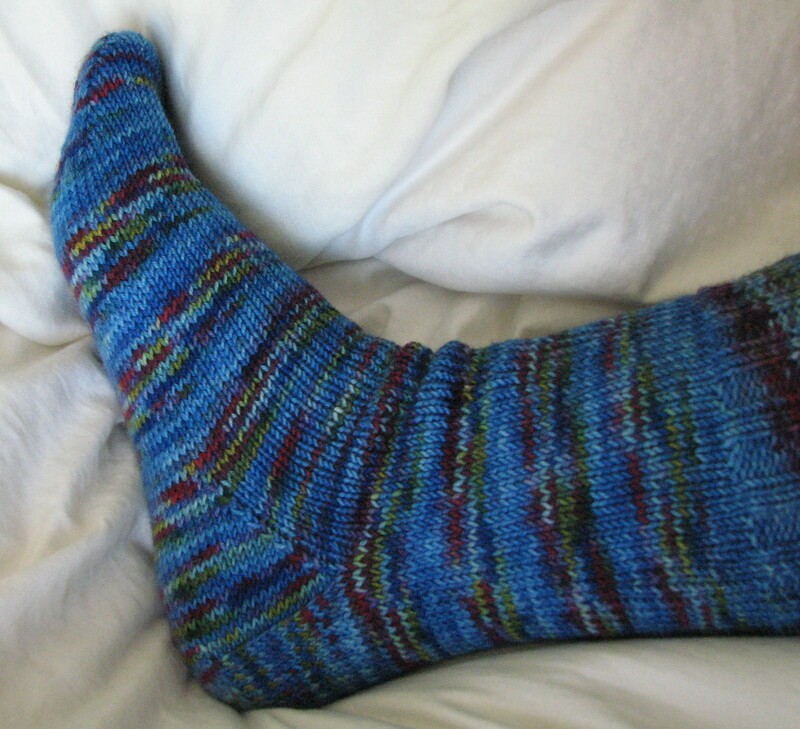 I used 2.5 mm needles and sock yarn, just like the pattern demanded. The pattern required 7.5 per inch – I figured it was close enough. I think it might be sensitive feet. I just figured I was doomed to knitting inside-out socks from now on, but you are right – I only need to do that for the sole! Thanks, total stranger! She beat me to it! I’ve also doubled the yarn on the sole; not a lot of fun to do, but it makes a softer pad. Mind you, I was doing a big sock. I usually use size US 0 or 1 needles (2.0 or 2.5 mm) and get 8 or 9 spi or more, depending on the yarn… but I’m a tight-knitting fanatic. Unless it’s supposed to be a super-drapy lace shawl or something, I really like a firm fabric. I think the difference between the 7 spi you got and the 7.5 that the pattern called for might just be the increment that makes the purl bumps uncomfortable – in general, you should use whatever needle size works for you to get the specified gauge, which will not necessarily be the same needles the pattern-writer used.